The menu consists of a Seafood Chowder, Sandwiches, Salads, Hot dishes, Pizzas and Homemade Desserts/Pastries. They also serve a selection of Suki loose leaf teas, a variety of coffees (Americano, Latte, Cappucino, Mocha etc), soft drinks and juices. There are two white wines and two red wines both served by the glass or bottle. The menu may read very simply, but the cooking here is really accomplished and well presented. The seafood chowder is made with prawns, smoked haddock and organic salmon stock. Two sandwich choices are available – Hot bacon, fried onions, tomato and cheddar on Focaccia bread or a Roasted red pepper and almond crush with mixed leaves on red onion bread. The chowder is priced at €6.50 and the sandwiches at €8-€8.50. Four “Hot Dishes” choices are also priced at €8-€8.50 and include Fishcakes, Omelette, Goat’s cheese tart and Scrambled Eggs. The salads are very fresh, full of flavour and beautifully presented. There are five salads to choose from and these include a smoked salmon based salad, a Beetroot and feta salad, a Blue Cheese, walnut & Pear salad, a Pork & Apple salad and a Green Leaf salad. The salads are priced at €7.50 with the exception of the Green Leaf salad which is priced at €4.50. All the salads are served with breads and butter. 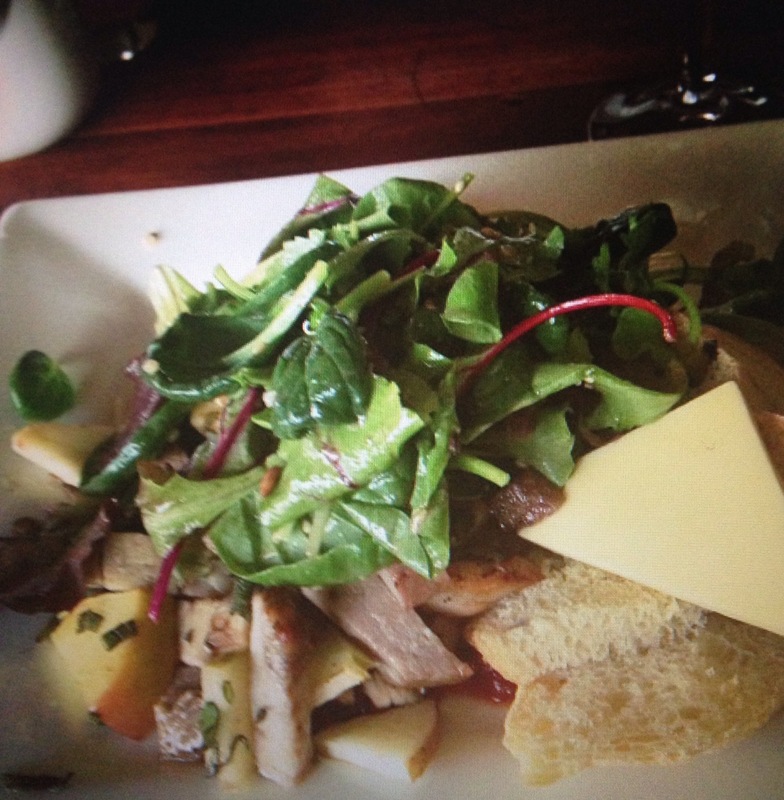 Pictured: Grilled Pork & Apple salad with crispy sage served with red onion and tomato relish. 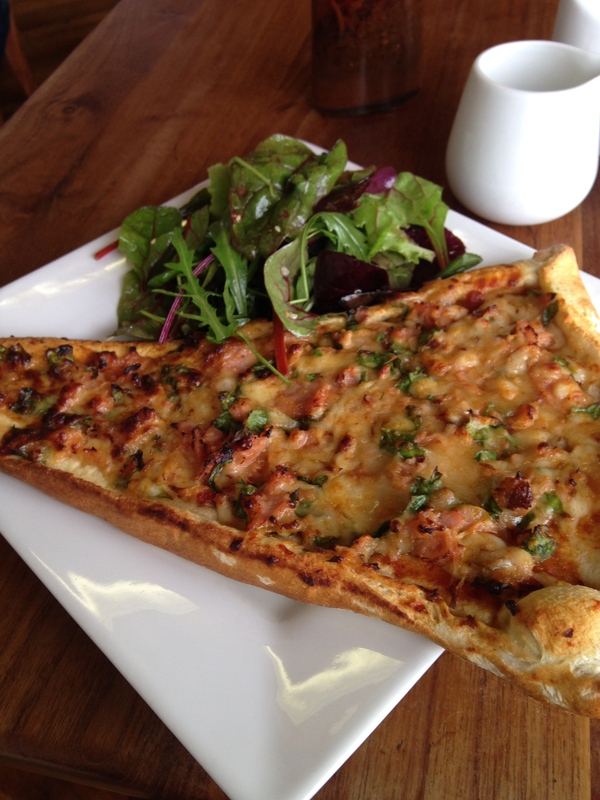 The pizzas are served in large triangles, roughly about two large slices of your more traditional pizza and make for very filling lunch for one. As the little girl at the next table said to her Mommy, “they’re good pizzas Mom, not junk pizzas” and she is not wrong! There are four pizza choices available; Salami served with cheddar, caramelised onion and tomato, a Smoked chicken pizza with olive, feta and spinach, a Brie and red onion pizza served with sundried tomato and basil and finally a Smoked Salmon pizza with cheddar, cherry tomato and rocket. All pizzas are priced at €8.50 and are served with dressed greens on the side. Pictured: Salami, Cheddar, Caramelised Onion and tomato pizza. There is always a wonderful selection of sweet treats to choose from to finish a meal including Chocolate & Beetroot Brownies, Carrot Cake, Hazelnut Meringue, Eclairs, Crumbles and more. Desserts are priced in the €4.50 range with scones at €2. Builin Blasta is a busy spot and you may have to queue for a table but generally turnover is quick. The food is super and staff are very friendly. Pizza and a glass of wine for €13.50 – what’s not to like?